The FRITZ!Box automatically connects to the internet when you insert your SIM card into the FRITZ!Box and enter the PIN in the FRITZ!Box user interface. All of the computers, smartphones, and other devices connected to the FRITZ!Box can then use the internet connection at the same time and have equal status. 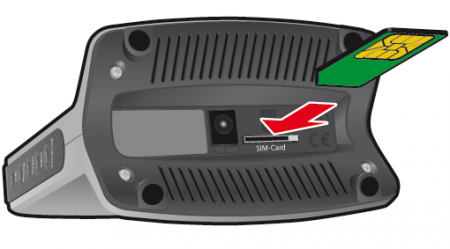 Pick up the FRITZ!Box so you are facing the underside of the device and can read the "SIM Card" label on the SIM card slot. Insert the SIM card (mini-SIM, 25 x 15 x 0.76 mm) that you received from your LTE provider into the SIM card slot with the slanted edge of the card on the left and the contacts facing downwards (see fig.). Important:Do not use SIM card holders with micro or nano SIM cards that have already been punched out because they can get jammed and damage the SIM slot. Push the SIM card gently into the SIM card slot until it clicks into place. Note:Press the SIM card briefly to remove it from the SIM card slot. If the FRITZ!Box is set to factory settings, set a password for the FRITZ!Box user interface, and click "Register" and then"Next". Enter the PIN (Personal Identification Number) for your SIM card. Important:The PIN contains only numbers and not letters or special characters. If you enter the wrong PIN three times, you must enter the SuperPIN/PUK. Refer to your LTE provider for information on the PIN and SuperPIN/PUK. Select your internet service provider from the drop-down list. 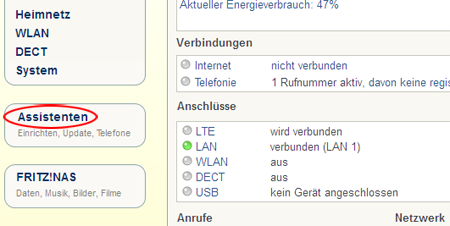 If your internet service provider is not displayed, select "Other internet service provider". You cannot configure mobile telephone numbers in the FRITZ!Box.